JV Shoes online fashion shops is an elegantly and luxuriously designed for any fashion with the most popular colors. We stand behind it with top –notch support team. It has been released with a lot of excitement of our developer team and tester. If you are looking for a nice looking online store which has ecommerce functions, have a look at this a stylish template. JV Shoes is the best choice for you and the only thing you will ever need. Although designed for shoes store theme, it can be converted to any type of related online shop. JV Shoes is a clean, flexible and fully responsive. The fair background highlights items out of the layout to make them brighter. The attractive slider, catching banners, scrolling effect, powerful Hikashop ecommerce component – all these will definitely serve your business interests and capture as many as customers on the internet. JV Shoes is extremely straight forward and intuitive to manipulate. As one of the newest template powered by latest JV Framework 3.3, JV Shoes can be customized so easily without coding involved like color, logo, adding scrolling effect, google fonts… Shoes of famous brands can be displayed on slider and banners in the homepage. Are you convinced yet? Don’t let you fall behind the competition by choosing this template for your Joomla site. Now take a new step toward a change for the best! Available in 4 beautiful colors: Green, Orange, Pink, Yellow. Easy to preset, within 2 clicks to change entire color theme. HikaShop is a shopping cart solution available for usages in any Joomla! site. It allows you to create and manage your online store with ease, simplicity and flexibility. JV Shoes is integrated with K2 component – a perfect replacement of the default article manager in Joomla. K2 helps you save content management time and better performance. JV Shoes is built in JV Framework integrated Bootstrap Mega drop-down menu. This type of navigation making the site look greater and more artistic creativity, quickly navigate your visitors to categories and products. 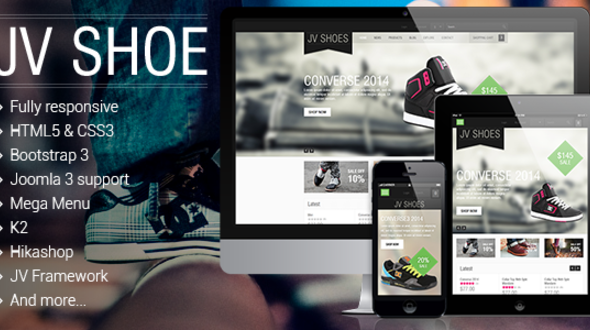 Besides responsive feature, JV Shoes can be set with unique mobile layout making it cleaner and load much faster when displayed in mobile devices. 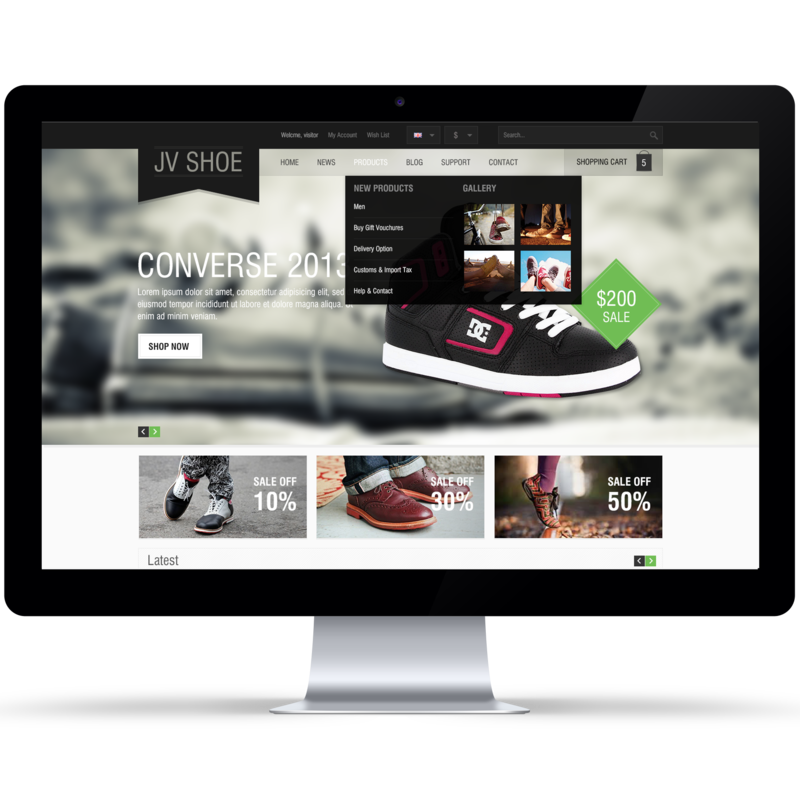 JV Shoes is driven by standard HTML5/CSS3 modern technology and optimized for Firefox 5+, Internet Explorer 9+ and Chrome 13+. IE 8+. JV Shoes utilizes JV Slide Pro – exclusive and professional extension to build slides with extremely beautiful effects – Check this extension out! Scrolling effect is one of the latest feature added in JV Framework 3.3. With this feature you can integrate scrolling effect to any page on your site. JV Shoes is built in JV Framework 3.3 and Bootstrap 3 to standardize grid and modules with much less efforts which is fully compatible with latest Joomla! 3 CMS, brings a lot of new functionalities. Available in 4 beautiful colors. Right to left language layout. Built in JV Framework 3.3 and Bootstrap 3. Fully compatible with latest Joomla 3.x. Unique mobile layout making it cleaner and load much faster. Build slides with extremely beautiful effects. Support detailed clear user guide and quickstart package. Any pre-sale questions with product, please feel free to contact us.